Cheeks, if you’re not familiar with them, are delectable for braising. They’re a little fatty, and have tough muscle, so they turn into wonderful, tender morsels when cooked. We found beef cheeks, so that’s what we used, but it originally calls for pork. If you’re serving it as a main meal, cook small potatoes in with the meat. 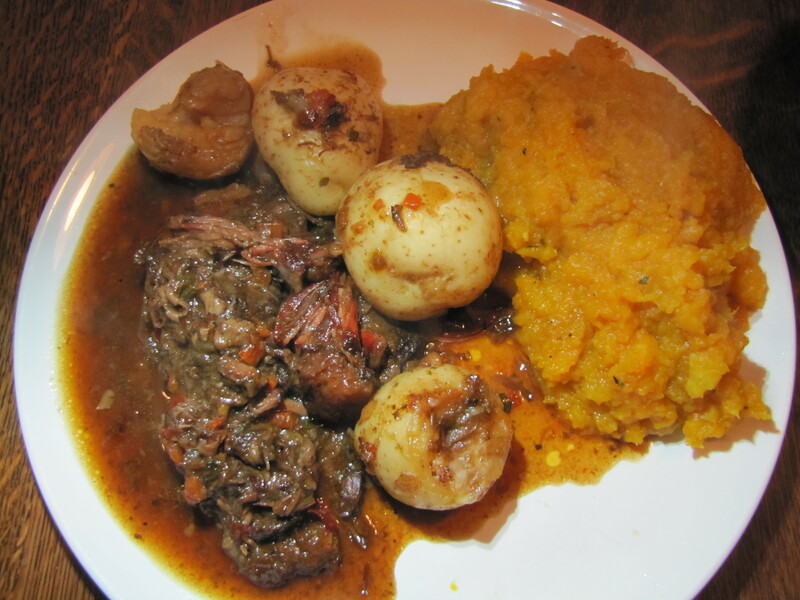 In the picture above, we served it as a winter dinner, with kabocha squash mashed with a bit of nutmeg. It would also be excellent served as small bites, on toasted bread. Instead of using beef stock, we just roasted a few oxtails, and threw it in to cook with the cheeks. Use either one. If you’re using the oxtail (or spine would be just as good) instead of stock, first roast the bones in the oven, at about 350F (180C) until they’re dark brown — maybe 1 hour. Meanwhile, make a paste with the honey, thyme, parsley, and the garlic in the mortar and pestle, adding a little water if you need to combine everything while mashing. Rub this paste all over the meat, and let it sit for an hour, or overnight in the fridge. Heat a pan until it’s quite hot over medium-high, with a little bit of oil. Dredge the cheeks a few at a time in enough flour to lightly coat them. Brown the cheeks in the pan — only doing enough at one time, so that they barely fill the pan, and aren’t piled on each other. Deglaze with water as needed. Add more oil if needed. (Note, Eliseo thought the garlic smelled as if it burnt during this process. You can alternatively not-include the garlic in the marinade, instead, chop it finely and add at the next stage). Make a soffritto with the onion, carrot and bell pepper. Sautee the vegetables in the same pan you browned the meat in (scraping off the delectable brown bits ), and adding a little oil if necessary. When the vegetables are starting to turn golden (15 or 20 minutes), add the cheeks back to the pan, and the port. Reduce the liquid by half. Add the bay leaf, half the salt, and the black pepper. If you’re using stock, add it now, otherwise add the oxtail, and 3 cups of water. Bring to a simmer. Cover the pot, and cook over low heat for about 1.5 hours. Add the apple, peeled and chopped into a small dice, and the potatoes if using. If you’re using bigger potatoes, cut them into bite sized pieces. Taste for salt, and add more if you need to. Uncover, and continue to cook for another half hour, reducing slightly. The meat is done when you can stick a fork in it, and it pulls apart easily. Serve warm.